Memory and Language – an experiment. I’ve always been fascinated by the role memory plays in language acquisition. It isn’t a straight forward relationship (better memory = better fluency) however, looking at student “2nd language memory” does allow us teachers in a very crude way, to gather knowledge about student fluency. There is a lot of research on the subject, no better place to start than the Journal of Memory and Language. Highly technical and it’ll cost unless you are employed by a university with access. However, lots there. I’ve collected some bookmarks that have some general articles on this topic and cognitive linguistics. For the lay teacher like you and me, the issues revolve around working and stored memory. Also issues to do with the right and left hemisphere (where language is contentiously said to “reside”) and brain plasticity in general. But this isn’t my reason for posting (other than to jostle some curiousity). I’m posting because I have a request. I’d like some teachers to try out the following experiment and then report back. The experiment is based on my own observation that student fluency is directly related to short term memory recall of language items. When I first began teaching I was given leveled classes and a busy schedule. Evening classes. Inevitably, the school owner would come to me between class breaks and just before classes, asking me to “test” a student, so we could put them into the correct level of class. I was always rushed and didn’t have a lot of time to spend with them. I had to get a system for quickly discerning their level but which wasn’t so subjective and cursory. What to do? I started having them do the normal quick placement paper test. In addition, I talked to them for 5 min. Socially and then using a photo, asking progressively more difficult questions. Once they began making mistakes in both form and function/meaning – I’d knew which level they’d be put in. This still took a long time! I just couldn’t do all that, every day and still prepare for classes and have some downtime to recuperate between classes. What to do now? So this is what I did and it worked. I’d like you to repeat the experiment and give it more validity (or destroy its validity!). It would also make a great MA thesis, if anyone needs one! Give the student who needs to be leveled a short story, one paragraph long. Here’s a sample. John is 21 and studies math at university. He lives with 3 other students in a 2 bedroom apartment on the 5 th floor of an apartment building, outside of the city. Every Friday he does the shopping. He buys a lot of pasta and rice. He also likes meat pies and potato chips. His budget is usually $45 per week. Sometimes, he buys ice cream. He never buys candy. He walks to the grocery store which is about 6 blocks from his home, near a park. If it is raining he takes the 618 bus which takes about 5 minutes. The hypothesis to be tested is: Is the amount of immediate information recalled (remembered) by the student related to their language level? If so, how close is this relationship? My contention and informal findings are that memory is related to language fluency level. All students understand everything in the passage for the most part – however, only higher level students are able to store the information (because they aren’t focusing on form so much – this is related to Van Patten’s input processing hypothesis (1992), that meaning and form cannot be attended to at the same time by second language students). This test/experiment might be a very objective and quick way to give a placement test. Much more accurate I believe than the present day tests which are very elaborate and thus, due to this complexity, allow students to “trick” the test and cause problems in validity. What do you think about my experiment and the relationship between working memory and language fluency level? Who’s Speaking? Guess the Accent. just wondering – do you tell the students beforehand what kind of question they’re going to be asked afterwards? I’m asking mainly because even as a native speaker, I’m not too good at paying attention to those kinds of details. Reading a newspaper article, I pretty much skip over the numbers and place names (not consciously, of course), and I do this in both my first and second languages. With this kind of text, I would probably skim through, looking for the ‘hook’, or interesting part. I wouldn’t be bothered about the details, so wouldn’t remember them (I just tested myself with this text and I was terrible!). What would be better? I don’t know. Another language/memory-related thing I’ve noticed, as a student at a foreign university, is that over time my verbatim note-taking has improved. When I started I would have gaps every 5th word (often the important ones!) or at the end of a sentence, and now I can get… almost… all of it. Again, this quite a specific type of memory, and some people might already be better at this kind of task than others. This kind of activity would also probably be less suited to your context/needs! My other worry is that lower-level students might actually remember MORE of the small details, as these are the things they manage to ‘hook on’ to, than higher-level ones, who might have the kind of problem I mentioned above. But if you say it works, I take your word that it does! In any case, I imagine some of these problems would be avoided if the students are given an idea of the task objective in advance. Thanks for sharing, anyway! I think this is a carefully-considered testing method, and I fully intend to try it out next time I have a chance! I look forward to hearing others opinions and experiences! Great comment and glad to see others finding these sorts of things interesting. I’m an amateur at this sort of thing but I think many are “groping” when it comes to the brain. But I think the payoff is fruitful if we combine the actual physical stuff of the brain with actual behavior. To your first question. The students obviously know it is a “test” and everyone is already quite acculturated with the facts of what that means. I also think it would ruin the result if you asked them to “remember” , even if indirectly. You want to find out how much they do recall under normal reading circumstances (without much or any interference from complex vocabulary). Of course, everyone doesn’t pay attention to these sorts of “figures” and I think even many native speakers wouldn’t score 100% but they would score higher than second languague speakers. There would be a gradient from a low level second lang. speaker to high level to native speaker. Me thinks…. I’m not sure about your hypothesis vis a vis lower level students. But that’s what the experiment is for! My own prediction is based on my own very radical notion that we have it all wrong in SLA on many counts. We tend to borrow the model of Chomsky, that learners “turn on” a language acquisition device and then learn the language subconsciously, making corrections for interference and form. I’m not so sure that the LAD is active for a second language learner after ages 6-7. I think the main factor is that the brain in “overloaded” and can only has the ability and access to a small amount of short term memory (think of a computer of old, with 156k RAM trying to run Windows 7). Without the brain heated and overloaded (much like a mentally disabled person), the learner has a hard time in that environment. But through time and training that memory is used more efficiently as the language information is accessed through long term memory (and I’m also a bit radical in believing that we don’t actually “store” information in the brain – that the brain is actually a receiver, like your cell phone, it only picks up information). But the main point is that low level students have a brain “overwhelmed” and won’t remember much, if anything beyond the main message, shadow of the story. Higher level students more. That’s my hypothesis but I may be wrong! Yes, I hope some teachers try it out. It is quite simple and if you have access to a wide range of students that you are sure about their levels – it would be interesting and fruitful. Thanks for dropping in and please let me know of any results! I’m not sure. I’m currently teaching conversational English and as part of the curriculum I do semi-regular listening tests, where I read a short story to the students and then ask them questions. It has been my observation that there is no relationship between the level of the students and how well they do in the test. Having said that, the level the student is in is directly related to there speaking skills, not to their exposure to English. Some of the students have been reading and writing English for several years but are only now learning to speak and so are in a low level class. Others have been studying reading, writing and speaking for only a few months but due to diligent work are in a higher level class. yep, the jury is still out but I’d love for someone like you – to do some action research. I think comprehension questions good and well but much more powerful is the retelling by the student. There is much more student talk time and you might try that after your story – what they recall is also a big form of comprehension. 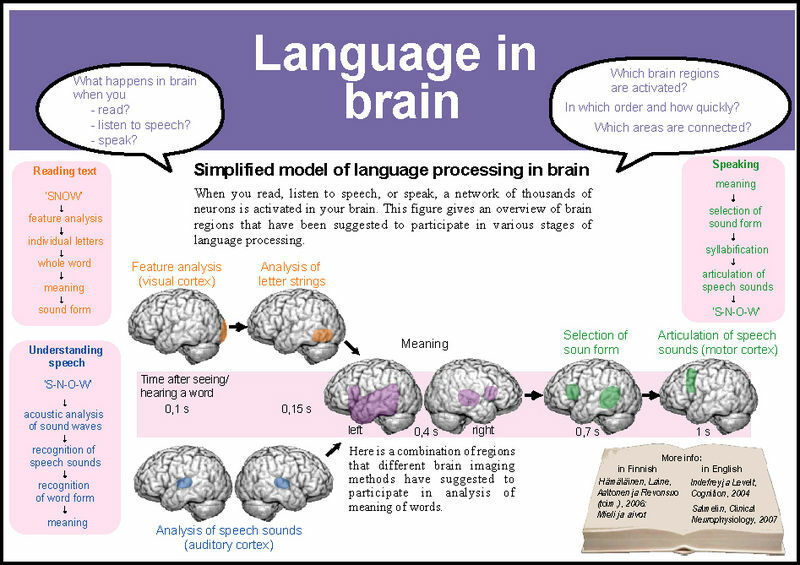 I also have an interest in how memory is a part of learning a language. However I am more interested in how the information is presented visually. I know its a bit of topic but am wondering if you have any insight on text book design. I’m interested in how text books are visually organized and how or if they have been designed in a way to maximize students learning. I’ve been reading up on Cognitive memory techniques and how I could utilize these tools in the classroom and began to wonder why these techniques seem to be (visually) absent in textbooks. Techniques like “mind maps, chunking and other memory tools seem to be rarely used. I began to wonder if this is because they are not thought to be effective (which after a few test I have seen that they are effective). Or, are there specific rules or formula’s that need to be adhered to which make it difficult to display information differently. Or, are they not used because they don’t fit nicely on the page?? Graphically speaking (in my opinion) text book layout has changed very little over the years. We use so many different visual tools on posters for shops trying to inform people of cheap apples, yet these visual tools seem to be absent when we try to inform people about a language. Anyway, I would love to hear your thoughts on this and if you know where I might be able to get more information. This is actually the very think I was looking for. I will be giving a presentation on adapting the Korean textbook to memorization techniques ( I really don’t agree with textbook memorization) And I really don’t want to sift through my dear professor’s BIG GREEN BOOK even if he did write it~!! Memory is a fascinating topic and more so in the context of SLA. I think we overlook the importance of the brain’s functions and limitations and think that our students can receive unlimited amounts of input and somehow this input will transfer to long term memory. Sure if it is drilled and repeated enough times but does the learner actually have an understanding of what the information means? So while we have to work with HOW information is stored and retained for L2 learners, we also need to make sure that what they retain makes sense and is USEFUL. Activating students formal and content schemata is also useful in helping them retain new information because it is linked to prior knowledge. I started with comparing student’s short term memory of two lots of vocabulary; one lot (of 7 words) presented in a “list” format (a basic 7 word list down the page). The other 7 words I presented using a “box” format (7 “boxes” in different sizes containing 7 words of different sizes in different shades of gray). I wanted to see if the different sizes, colours and placement would help the students remember words more efficiently. Both groups of words were presented to the students for one minute; they were removed before the students wrote down the words they remembered on a hand out which had an empty “box” grid for them to fill in. The results were as expected; the “box” format was a clear winner. This was also the case after I got them to repeat the test 2 hours later. Conclusion 1; the “box” format was more effective. Words presented in a “list” format is not (in some cases, no where near) as effective as presenting them in a more graphical stimulating format. For the first round of tests I didn’t worry too much about spelling. I counted words that had minor spelling mistakes as correct. In the next round of tests I wanted to see if there was a way to improve on the “box” format and improve students spelling. To do this I divided the alphabet into 4 basic shapes. Vowels were represented by a circle. Ascending letters (such as h, t, l, f) were represented by a ascending rectangle. Descending letters (such as a g. j, q, p) as a descending rectangle. The other letters (such as r, v, c, s) we presented as a square. So, a word such as “long” would be presented on their hand out in the box as; ascending rectangle, circle, square, descending rectangle. I thought that having the words already presented to them on the page in this format would dramatically improve their recollection of the vocabulary as well as improve their spelling. The words are “to some degree” already given to the student. It was for me (and some other native speakers) allot easier to remember or decipher the word from just looking at the shapes and then going through different letter combinations. The results however were less convincing; the results did favor the “box+shape” format compared to the previously used empty “box” format, however not in the convincing fashion I had predicted. I tested this for a couple of weeks to see if the results would improve as the students got more familiar with the “shape” format. They did not. The results continued to be inconclusive as the results varied allot between different students and classes. Age did seem to play some part, as the older students did do better using the shape format than the younger students. One other interesting result was that it didn’t seem to matter if the vocabulary was new or had been previously taught. The new format did improve their quality of writing. Conclusion 2; the box+shape format slightly improved students memory of words as well as their spelling. I wasn’t ready to give up on the box+shape format. Although the improvement was only minor there was an improvement compared to the “empty box” format. Also results did seem to increase as students got more familiar with the idea of having the alphabet represented as 4 basic shapes. Therefore I continued my tests, but this time I had students copy the vocabulary 3 times before the next test (2 hours later). I thought that having more interaction with the words before taking a second test would increase there overall results as they have not only seen the vocab for one minute on the board but have also had some interaction with it. After a second test, at the end of the class (about one and a half hours after practicing the vocabulary) their overall scores improved to their initial test (done after only viewing the vocabulary for a minute). But there was once again no great improvement between the “empty box” format and the “shape+box” format. Conclusion 3; students memory improved when they have more interaction with the content, yet there was no definite improvement when comparing the “empty box” format to the “shape+box” format. It was now time to put the idea that students remember words better in context to the test. Once again I would test to see which format was more effective; the “box” or the vocabulary presented in a sentence. The sentences were different sizes and the target vocabulary was a different colour. The test done right after viewing the vocab was in general, similar or less effective when present in a sentence. Students didn’t seem to take the time to read the sentences instead they only focused on the words and tried to remember them the same way they tried to remember the vocabulary in the “box” format. The test at the end of the class after copying the words was no better than the initial test. Again the overall results were better after they had some interaction with the words but there was no real difference between the “box” and the “sentence” format. The test that gave this idea the results I was expecting happened when I gave the students the same test the following week. Only then were the results consistently in favor of the “sentence” format. Conclusion 4; sentence improved students long-term memory rather than there short-term memory. After seeing that the students were able to remember vocabulary better when they are presented in a sentence I began to wonder if this could also improve their grammar knowledge. I began placing the names of a grammar function in a sentence using that grammar structure. For example “comparative” would be in a sentence such as: The word comparative is longer than the word pizza. He is a pronoun. May I have a modal please? The names of the grammar function were presented as the “new” vocabulary (in different colours and using the shapes for spelling) but because they are in a “meaningful” sentence I hope that they remember not just the names of the function but also how to use them. So far the test results are showing that this is an effective method. Not only are the students remembering the names of the grammar functions better but they are also able to use the functions in a sentence successfully. and of course sentences where you put words into context are going to be more effective than learning a word as a stand alone. I don’t have the proper words to explain what is going on cognitively because I am no psychologist 🙂 But I think you have the right idea in taking into consideration visual stimulation, color, shapes and context all which are stimulating for the brain and in helping retention of information! I would really like to try these ideas with your permission! Thanks for sharing and lots to ponder. Nice to see teachers doing such important action research and using their classroom as a proving ground. Yes, you are right to offer your words of caution about repetition. There must be more than just repetition. At EnglishCentral, a website I’m helping to develop, we also factor in time when looking at memory. So we have to think about Context + Frequency of Encounters + Time delay of encounters with words – when looking at retention. But I do think a lot more can be done in the field of mnemonics, tricks like you suggested to get students remembering and even more importantly, pulling up words and transfering them from short to long term store. First things first, Angie of course you have permission to use some, any or all of the ideas shared on the above posts. If you would like I could send you some files of what I did to show you how/what I did. It’s probably easier and quicker to understand when seeing something rather than me explaining it. ddeuble, thank you for mentioning “wordle” and “tagxedo” I wasn’t aware that there was a name for these and they are to some extend exactly what I’ve been producing. The idea of having the text surrounded by a box in my mind is another visual tool to help students remember what goes inside them. In stead of giving them a blank piece of paper to write on what they remember they see boxes of different sizes to “fill in”. The big box contained a big word beginning with “b” etc etc. As for Kinetic Typography, I have briefly had a go at this with very poor results. I again used groups of 7 words and tried a few different ways of presenting them. I had the words scroll from right to left one after the other. I had words fade in and fade out one after the other and flash up in quick secession. These methods were less effective than the “list” format. Even though the total time was the same as the other tests (about 1 min) students had forgotten the 1st and 2nd word by the time they reached the last word. I think the reason for the results is as follows. When we present the vocabulary at the same time they don’t spend an equal amount of time on each word. They skip over the easy words and focus on what they consider the difficult ones. They don’t just look at the words one time but go over them again and again until time is up. Some also establish relationships between the words, the first word begins with “ba” and so does the 3rd one. This is probably another avenue to venture into when designing the “wordle”, to design it in a way where the words have a close relation to each other. I do like the idea of Kinetic Typography but am yet to think of a way of how to effectively use it. I truly appreciate you sharing your ideas! Kinetic Typology… something to think about!